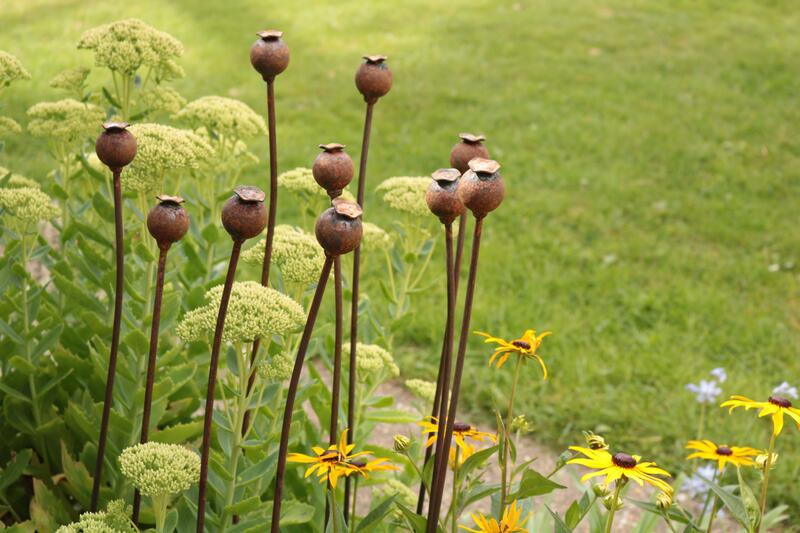 All our metal work is made here in Hampshire by us and we’ve lovingly designed and manufactured products that will both look great but be practical in the garden too. In fact you’ll see quite a few of our products up my allotment! I simply love the poppy seed heads which also make my flower patch look beautiful in the Winter too and the slate labels line my plot and enable me to easy identify all the plants growing (we sell them as a set too which is perfect for a gift!) The wigwams are collapsible which is so handy for Winter storage and during the Summer they can grow anything from sweet peas, climbing beans and even climbing squash! Then there’s the cloche hoops, the perfect way to extend the growing season and yet again they can be stored away when not in use. We are also pleased to announce that a larger size cloche hoop will be for sale on the website over the next week as well as end panels to fit both our hoops! Our little shop also stocks quite a few new products such as this very handy ceramic slug trap, 3 different sized wire baskets (you can never have too many baskets right?! ), a beautiful wicker bird nest and a copper plated plant line to make sure you get all those seed sowing lines nice and straight! Of course that is just a short list of a few of my favourite products from our online shop but there’s plenty more! We stock a vast array of vintage items too including lots of enamel, galvanised and copper planters, pots and containers. Wooden trugs, decorative vases, old tools and compost bins… Things are being added daily so if you’ve been inspired then head on over to the shop to have a good look yourself, you’ll never know what you’ll find. Plus we are currently running a 30% discount off all lights and 20% off all gardening aprons! As a small business we value every single sale and we are so grateful to all our customers that have supported us and helped us grow this past year. We wouldn’t be here without you and you are constantly inspiring us to keep on sourcing exciting products and encouraging us to produce new ideas with our handmade metalwork range. P.S Just a little note to say that there are only 23 Lavender and Leeks 2019 Calendars available and once they are gone they are gone! They can be posted to the UK, EU, USA and Australia too!